In a medium bowl place the lettuce, chicken, grapes, and ranch. Toss until coated. Place mixture down the center of a tortilla and fold up like a burrito. Need a new lunchbox solution? Gotcha covered! Try this fresh sandwich wrap for your kids' lunchbox -- and your office brown bag lunch! We're deep into the grind in my house, which means school, homework, and lots of sports. My sons are creatures of habit and love the same items in their lunch box every day, while I always try to add variety to open their eyes to new foods. My kids request a turkey and cheese sandwich religiously, but last week I managed to sneak in these Chicken Chunk Grape Wraps. I’ve found that kids like simple and tasty foods that don’t have too much going on, and that’s exactly what these wraps are. My sons objected at first to trying something new, but once they had a bite they asked if they could have them in their lunches tomorrow. Good sign! 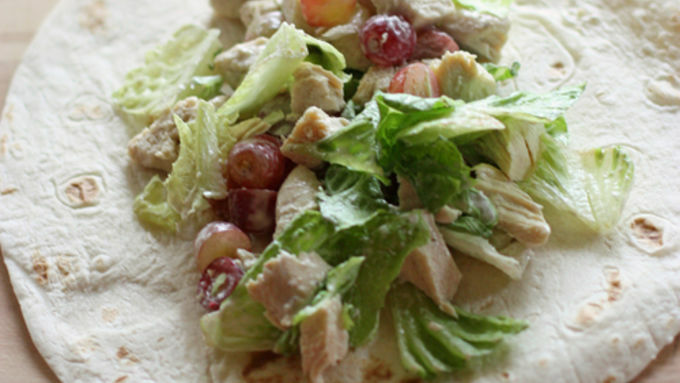 These wraps are made from a mixture of chicken, sliced grapes, lettuce and a drizzle of ranch dressing all rolled up in a tortilla. If your kid's a “dipper," which I think almost all kids are, you can leave the dressing off and just let them dip the wrap in the dressing. These wraps are definitely not just for kids. I gobbled up one for lunch on a whole wheat tortilla as a healthier option. 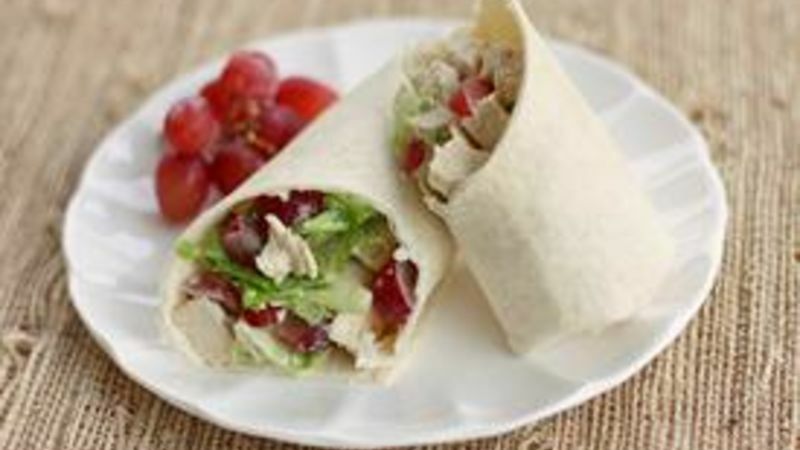 These quick and easy wraps are a great alternative to sandwiches and perfect for lunch boxes.